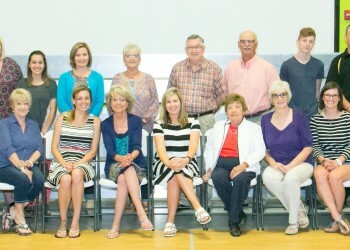 The Harper County Community Foundation recently recognized the grant recipients for the May 2018 round at an Awards Presentation held in conjunction with their Annual Meeting and Family Grant Party. The event was held at 7 p.m., on Tuesday, May 22nd at the Anthony Christian Church Gym in Anthony. The Foundation would like to thank the Anthony Christian Church for hosting the party and The Arts Center for providing entertainment for the children in attendance. For this grant round, 41 grant applications were submitted to HCCF with a total of $344,988 requested. The Foundation awarded $115,044 to 34 organizations and projects that benefit Harper County. Winners of the American Legion, Jean Jensen as well as the Jack and Lavera Bertholf Scholarships were also recognized during the event. HCCF wishes these scholarship recipients the best of luck in their future endeavors. HCCF’s Mission is focused on education, human needs, health care, community improvement or rural development projects that will enrich the communities of Harper County through support and resources. The deadline for the next grant round will be October 1, 2018. More information about HCCF may be found on their website at www.harpercofoundation.org. In addition, any questions may be directed to Michelle Fahring, Assistant to the Foundation, by calling 620-840-1153 (cell phone), or by sending an e-mail to harpercofoundation@gmail.com. Pat Patton and Loretta Kerschen, Hospital District #6; Holly Noble, Attica Long Term Care Center; Cindy Brown, Attica Wellness Center; Valerie Ackerman and Janie Gates, Main Street Ministry; Mindy Westenhaver, Crossroads Family Resource Center; Bette DeMeritt, Anthony Theatre; Kathy Zimmerman, Harper Area Health Foundation; Juliana Whisman, The Arts Center, Inc.; LeRoy Matthews, Harper Public Library; Sid Burkholder, Anthony Gun Club and Jerry Turner, HCCF Board Member. Kevin Alexander, HCCF Executive Director; Alan Allenbach, City of Attica; Kristin Schainost and Lisa Newsum, Attica Public Schools; Christy Reel, Harper County K-State Research and Extension; Jennifer Wolff, Anthony Wellness Center; Bev Davis, Harper United Methodist Church; Eddie Barber, Harper Ministerial Alliance; Chet Barber, Anthony Golf Club; Ben Ridlen, Chaparral Project Based Learning; Craig Winters, Attica Public Schools; Lisa Mathes, Anthony Lions Club; Cindy Ash, Country Living; Jeri Jacobs, Harper Public Library and Britt Hedlund, Harper County Transition to Career.